It was my daughter's birthday ... oh about 10 days ago ... and 'life' has been crazy busy with zero, zilch, zip time to slip away into my craft room to create. 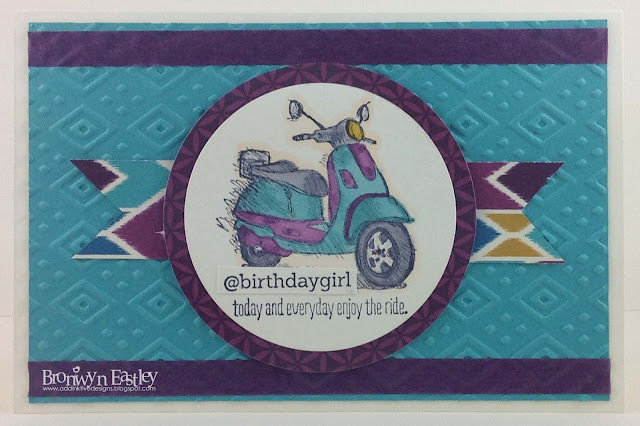 I was getting pretty frustrated just looking at my pre-order box full of goodies, however, I did manage to use a bit of the new 'Boho' washi, DSP and embossing on Laura's very belated birthday card (available 2nd June). Hopefully my mojo will pick up some more in the coming days as this very CAS card took forever to make! Great card Bronwyn! Love the bright, bold colours And how cute is that scooter and sentiments. 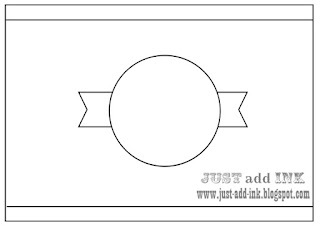 Thanks for playing along this week at Just Add Ink! Well this is such a sweet card! I love this super cute scooter - it's coloured perfectly! I'm sure your DD would have loved this, Bron. The scooter it just so cute (& I've wanted a scooter for forever) & the colour & patterns really work well. Glad you got some time to create & thanks for playing at JAI this week. Great to see you playing along with us again Bron! Fab card!